Just up the road from Stop 10 on the Ajo Mountain Scenic Drive in Organ Pipe Cactus National Monument is the trailhead for Arch Canyon Trail. I arrive just as Caroline (my neighbor in the campground) is putting on her daypack for the trek. She decides to wait for me so we can hike together. I quickly grab my daypack, a 26-liter Osprey Mira, which has a full (3 liter) bladder and my very trustworthy trekking poles. I am thrilled to be hiking with Caroline as she is a retired park ranger from Organ Pipe and an expert on desert plant life. And I really like her. Arch Canyon Trail is a two-mile round-trip, easy to moderate trail that steadily but gently climbs into Arch Canyon. It winds to the left in the picture above and after a mile ends behind the arch. Just as we begin, six people are coming towards us down the trail. All three couples are volunteer interpretive rangers for the winter season. The National Park service provides free, full hook-up sites for RVs in exchange for volunteering in the parks. Stephen and I really want to be volunteer rangers some day so I am happy to stop and ask them questions like “Where are you from?” “Do you like volunteering?”, “How are the RV sites?” etc. When the volunteers discover that Caroline was once a ranger in Organ Pipe they have many questions for her. We have a very nice conversation before continuing our hike. Along the trek, Caroline and I chat and she shares her knowledge of the desert plants we encounter. After about one mile she points out a much more difficult trail that climbs up to the arch. We both decide to turn back towards the trailhead as we want to complete the other day hike on the drive. Stop 11, the halfway point of Ajo Mountain Drive, is the trailhead for Estes Canyon/Bull Pasture Trails. Estes Canyon is a difficult loop trail with steep grades gaining 865 feet of elevation. Midway around the loop there is a short spur trail that climbs to Bull Pasture. Both trails combined is a rugged 4.1 miles round trip. I arrive before Caroline and find the volunteer rangers we met earlier lingering nearby. I ask them if it is easy to get lost on this trail and, although they chose not to complete the trek today, they assured me if I stay on the trail I should find my way back. Just be sure to sign in at the beginning of the trail and again at Bull Pasture. My new volunteer ranger buddies point out a toilet and insist that I check it out. Thinking it a good idea I head that way. Organ Pipe Cactus National Monument has the cleanest, nicest pit toilet I have ever seen. Up until now my favorite pit toilet was in Great Basin National Park in Nevada. (That one has a sink and mirror.) But this one is just plain clean. It even smells nice. Organ Pipe Cactus National Monument is in the heart of the Sonoran Desert. The Sonoran Desert is a green desert that covers approximately 120,000 square miles, about the size of the state of New Mexico. It begins in southeast California, covers most of southern Arizona, and continues down into Mexico and Baja California. Organ Pipe Cactus National Monument protects a portion of the natural habitat of the Sonoran Desert within the United States. Organ Pipe is also designated an International Biosphere Reserve by the United Nations. 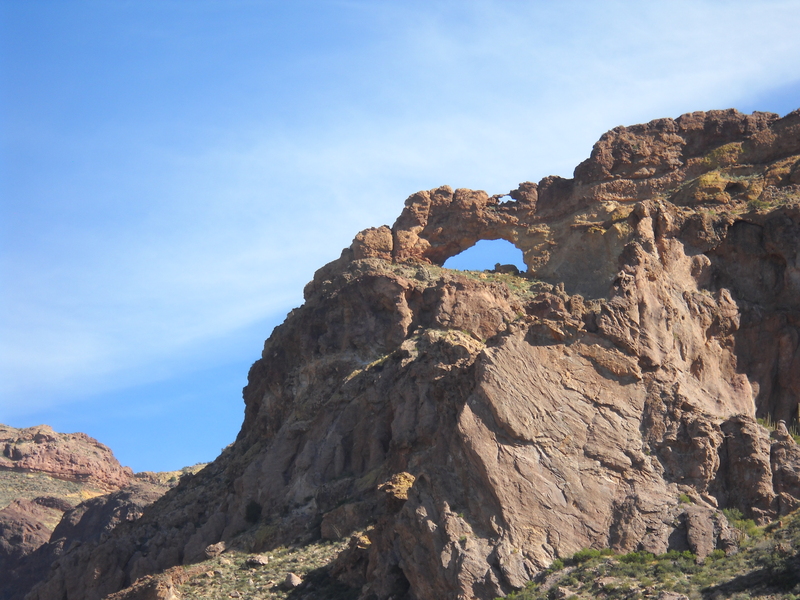 The scenic 21 mile Ajo Mountain Drive is a great way to explore the park. The Ajo Mountain Drive is a one-way, loop, dirt road that is maintained so any car can safely travel the 21 miles. Eighteen numbered signs are posted along the way with safe places to pull over to read the guide book that describes what is seen along the route. There are four picnic sites and two trailheads along the way as well. Stops 1 thru 5 explain much about the plant life of the Sonoran Desert. The Organ Pipe Cactus is most commonly found in Mexico but has adapted to life in the monument. 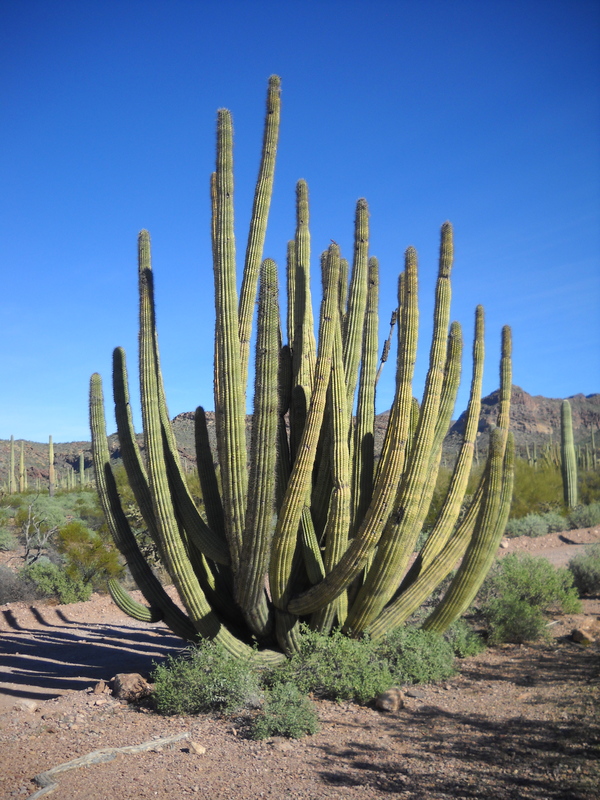 The Organ Pipe Cactus requires the sun’s warmth and cannot tolerate frosty nights. It flourishes in this part of Arizona. The drive is gorgeous! It is surrounded by the Ajo Mountains with canyons and washes and rock formations around every turn. I cannot resist stopping at Stop 6 for a snack at a picnic table covered by a ramada overlooking Diablo Wash (a canyon). I read in the guidebook about the people who have inhabited the Sonoran Desert as far back as 12,000 years ago. The Tohono O’odham still live on land west of the monument. I continue the drive stopping along the way and learning about the prickly pear cactus, the saguaro cactus, the creosote bush, the jojoba, and many other desert plants. The fruits from both the prickly pear and the organ pipe are edible. (Remember the candy I bought at the visitor center?) I also read about many animals that make the desert their home, and the birds that travel the washes as they migrate from north to south and back again. It is a gorgeous sunny day, about 70 degrees fahrenheit, and I am thoroughly enjoying the views. As I approach Stop 10, I decide I must do the first of two day hikes along the Ajo Mountain Drive. The wind finally settles down and it is very quiet in the desert in the winter. Looking out the south door of the tent, I can see the lights of Sonoyta, Mexico in the near distance. There are just a few; nothing like the lights of Juarez when entering El Paso at night. It is also very cold in the desert in the winter. I snuggle into my sleeping bag which is placed on top of Stephen’s very long Big Agnes sleeping pad that I had inflated earlier. I am still cold even though I have on a Smart Wool top, wool leggings, and socks. I open a fleece sleeping bag and use it as a blanket. I also put Stephen’s sleeping bag on top of that. Finally, I am cozy enough to sleep peacefully the rest of the night. Morning comes and I wait in the tent for the sun’s rays to take the edge off the night’s cold. I get dressed, eat a granola bar breakfast, and continue to drink water. I really want a cup of coffee but did not bring anything to boil water. I have two large bags of packaged foods such as tortilla chips and salsa, chocolate bars, granola bars, lots of nuts, a few Slim Jims, and several other items I purchased at Super Target in Phoenix. I easily have enough food for two nights of camping. I make a note to purchase a Jet Boil (and learn how to use it!) and to always remember fruit. 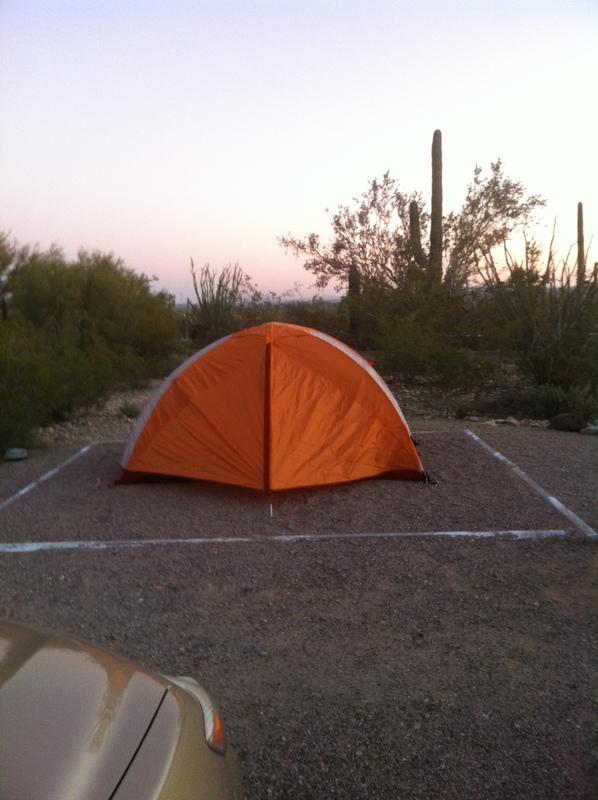 The campsites at Organ Pipe Cactus National Monument are laid out in a fan shape with a one-way drive around the perimeter and roads running from east to west. The tent sites are the last two rows with pull-thru RV sites towards the front. There are no hook-ups and generators must be shut down by 10 pm. The sites are clean and flat and private and are only $12 a night. The shower house has an actual Western toilet that flushes, a sink with a mirror, and a solar shower with a dressing area. This is exceptionally luxurious in a National Park! After using the facilities, I return to camp and greet my neighbor, Caroline, also a woman traveling alone. Caroline is a retired National Park Ranger. Twenty years ago, she was an interpretive ranger at Organ Pipe Cactus National Monument. She currently lives in Tucson where she owns and operates a B & B called Paca de Paja. Caroline is getting reacquainted with Organ Pipe because she has been invited to help lead a group excursion in February. I like her immediately with her calm voice and pleasing personality. I have a new friend already and begin making mental notes to stay at Paca de Paja while I’m in Tucson. We chat a while and make plans to meet somewhere along the Scenic Ajo Mountain Drive. The visitor center is always the starting place for exploring any national park and the Kris Eggle Visitor Center at Organ Pipe Cactus is no exception. Visitor centers almost always offer a short informational film and brochures for orienting to the park as well as volunteers to answer any questions and provide tips for things to do. After watching the film, getting my national park passport cancellation stamp, shopping in the gift store (I bought some Prickly Pear candy), and going over the park map with the volunteer ranger, I was ready to explore the park. After a fun, laughter-filled trip to the Fiesta Bowl with my husband and four wonderful friends, I left from Phoenix to visit Organ Pipe Cactus National Monument near Ajo, Arizona. The morning of January 6 was spent in Phoenix taking care of car maintenance; an oil change at Larry Miller Toyota in Peoria, followed by tire rotation at Discount Tire down the street. If anyone needs Toyota maintenance while they are in Phoenix, Arizona, Larry Miller is the place to go. Very nice people and an exceptionally nice waiting area with coffee, pastry breakfast, and free WIFI. Organ Pipe National Monument is on the Mexico border southwest of Tucson, Arizona. I arrived about 5 PM just as the winds were really picking up. Great…my first time to put up the REI Half Dome Plus backpacking tent all by myself. I wanted to purchase a solo tent for my travels alone, but Stephen insisted I would enjoy having more space. He was right. I did enjoy having space to put things. I even had a little sitting area with a Crazy Creek backpacking camp chair. It is very nice to be able to sit up with back support in a tent. Well, it took an hour to erect the simple tent that I have put up many times (with help) in about 10 minutes. The winds were crazy bad. It even blew away once! I chased it, caught it before it could cross the Mexican border, and staked it down with several extra stakes. That tent wasn’t going anywhere! Just in time for a simple dinner sitting in my car watching a beautiful desert sunset.